Service Rank and Number / Rheng gwasanaeth a rhif: Private No. 12493. 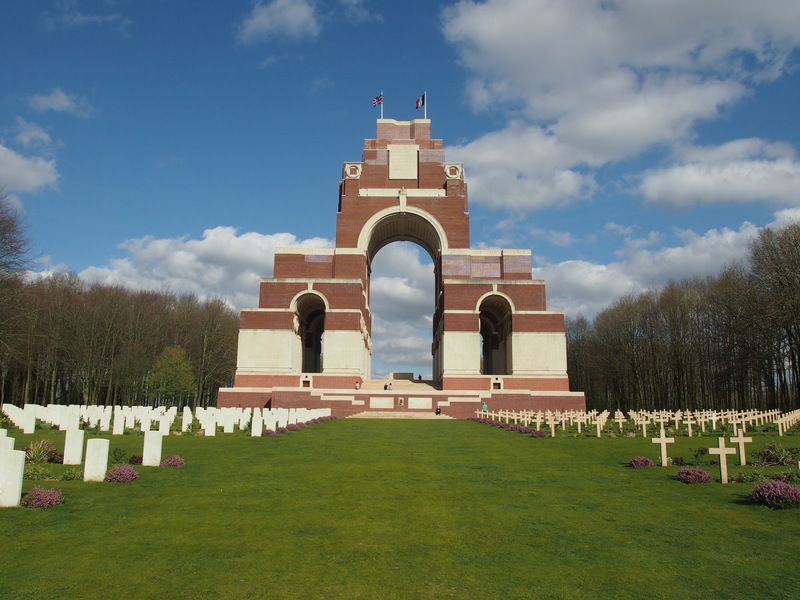 Military Cemetery/Memorial / Fynwent milwrol: Thiepval Memorial. Died of Wounds on 27 February 1916 aged 32 years. Emrys Crossley was born in Hawarden, Flintshire during 1881. His father was John Crossley, a Coal Miner who had been born in Ormskirk, Lancashire and his mother Martha Crossley (nee Davison), born in Hawarden, Flintshire. During 1881, the family lived with Jospeh Davison, Martha’s father at Aston Road, Aston, Hawarden, Flintshire. Nothing is known of Emrys’s early life, but the 1911 Census shows that he is now married. The family lived at 1 Market Street, Shirebrook, Nottinghamshire. The head of the family is Emrys Crossley aged 30, who is employed as a Collier Loader. His wife Sarah Crossley aged 26 and their three children – Levi Crossley aged 5, William Crossley aged 3 and Leonard Crossley aged 1 year. The family later moved to North Wales and lived at 3 William Street, Rhyl, Flintshire, where following the outbreak of the First World War he enlisted with 1st Battalion Royal Welsh Fusiliers at the Recruitment Centre, Rhyl. 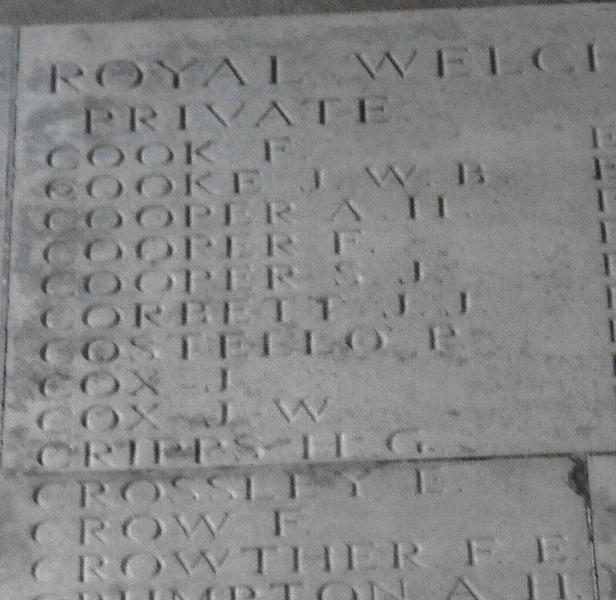 Photograph taken of Pier and Face 4A at the Thiepval Memorial, France showing the name of Emrys Crossley. The Royal Welsh Fusiliers Archives include a Casualty Book with an entry for Emrys Crossley which tells us that he had a shrapnel wound to his leg on the 3rd September 1916. He was treated and returned to his battalion the same day. He died of wounds on the 26th February 1917 but has no known grave which is unusual for someone who died of wounds. On 10 July 1917 a payment of £5.18s.6d was made by the War Office to Sarah Crossley, this being monies owed to her husband. On 25 October 1919, a further payment which is recorded as a War Gratuity of £11.0s.0d was also made to her. There is a Flintshire Roll of Honour Card for Emrys Crossley at the County Archives Office, Hawarden, dated 16 September 1919, signed J Williams.